Lovely conversation with Simon, Patrix, Hoi, Kham. As previously stated I’m not really interested in any Solar System model, but Simon’s model explaining what we see in the sky every night is most fascinating and potentially revolutionary. Could the flat earth propaganda be a cover for this potentially super disruptive astronomical model? This entry was posted in Audio, Clues Chronicles, Flat Earth/Solar System on April 10, 2018 by ab. Hello all ? How are you fellow thinkers? Hopefully healthy & happy. Cannot react (or even like) there anymore, so my reaction here. You can see Simon’s cherry picking in his latest post on Cluesforum. His reply to my last review email was “Wow, thank you so much Gaia, you just helped me in pointing out something good!” (getting Proxima Centauri -plus the exoplanet, not talked about- inside our solar system sphere). Eh yes, but that is cherry picking. I made the same comments as in this thread; that if you suddenly have so many bodies close to us, you cannot just not include them in your model. It is either-or. Or the stars are indeed so very close to us (and thus tiny), but then you need to rework your complete TYCHOS, or they are not so close to us, but then don’t claim that. Ah right. First you say “Proxima Centauri (b) is not inside our solar system”, which is half true; it is not in the plane of the solar system ecliptic [being at a declination of -62 degrees], but now you make an illustration where it looks like it is! Confuse and conquer, or what? But that was unanswered and deemed “not important” to actually think about I guess. Just cherry pick what you can use and ignore the rest. Like a real good mainstream bullpsientist! So if I am “a real good mainstream bullpsientist”, how would you call yourself? A “real good mudslinging bullshitter”, perhaps? In any case, you are clearly not a scientifically-inclined individual, since you obviously do not grasp the first thing of my ongoing stellar parallax research. Your last posts on the subject make me think you are a borderline imbecile. I should probably just ignore you altogether (as several good friends are advising me to do), but since I now have good reasons to suspect that you are a professional troll on the ESA payroll, I think it is worthwhile to spend a little of my time ‘humoring you’. You once called me on the phone saying you were a Dutch geologist (living in South America). Well, if you cannot even read / figure out the intended 3-D angles of a simple / makeshift 2-D map (such as my recent PROXIMA graphic), I wouldn’t hire you for any geological work / surveys. You obviously have sub-par cognitive orientation skills. To ‘humor you’, I have now drawn some lines and angle captions on that PROXIMA graphic which, hopefully, you will now understand. As for your above ‘chart’ listing 8 nearby stars and their officially-stated parallaxes, it simply shows that you have completely misunderstood (or pretend to misunderstand) my ongoing stellar parallax research. Note that, in my TYCHOS book (which I sent you free of charge), I do not claim to have resolved the entire stellar parallax conundrum – far from it. I only touch this subject in the very last chapter of the book – as a proposal for further (truly scientific) investigation. Whereas you, dear Gaia Clown, only slap in my face the official / mainstream ESA data as if they were completely legit, foolproof and trustworthy. So WHO exactly is a “a real good mainstream bullpsientist”, Gaia dear? So if I am “a real good mainstream bullpsientist”, how would you call yourself? An interested layman in astronomical matters, but at least someone who follows the scientific method of first compiling a hypothesis, then doing the actual experiments and then come with a theory, based on the results. Not the other way around and certainly not claiming “I have figured it all out, this is the best model, and anyone who objects is some paid shill or imbecile, or both even”. A “real good mudslinging bullshitter”, perhaps? In any case, you are clearly not a scientifically-inclined individual, since you obviously do not grasp the first thing of my ongoing stellar parallax research. Your last posts on the subject make me think you are a borderline imbecile. I should probably just ignore you altogether (as several good friends are advising me to do), but since I now have good reasons to suspect that you are a professional troll on the ESA payroll, I think it is worthwhile to spend a little of my time ‘humoring you’. The “humor” is all in your field, Simon. A “borderline imbecile”? Do you talk like that to the many astronomers who you hope will read your book and start challenging way more than I possibly could, because I lack too much knowledge in this field? Prepare for some nice “scientific” conversations then, Rome will be on fire. Me an ESA troll? Hilarious, man, you should do comedy. If that were the case, their training program was pretty bad, because I am just starting figuring out astronomy with your “help” actually, the book. So that’s why I went and created the glossary with useful terms to understand. Like I said before here. Indeed we had a 45-minute-or-so phone call when I started at Cluesforum. And you contradict yourself here. My point against your last graphic, before updating, was exactly based on proper diagram presentation in geology (or other disciplines like astronomy too), and that is properly annotating it with directions, angles and scales. In 1598 Epsilon Eridani was included in Tycho Brahe‘s star catalogue, republished in 1627 by Johannes Kepler as part of his Rudolphine Tables. In 1690 Epsilon Eridani was included in the star catalogue of Johannes Hevelius. In 1818 Epsilon Eridani was included in Friedrich Bessel‘s catalogue, based on James Bradley‘s observations from 1750–1762. All these researchers are listed in the glossary. Based on observations between 1800 and 1880, Epsilon Eridani was found to have a large proper motion across the celestial sphere, which was estimated at three arcseconds per year (angular velocity). This movement implied it was relatively close to the Sun, making it a star of interest for the purpose of stellar parallax measurements. This process involves recording the position of Epsilon Eridani as Earth moves around the Sun, which allows a star’s distance to be estimated. From 1881 to 1883, American astronomer William L. Elkin used a heliometer at the Royal Observatory at the Cape of Good Hope, South Africa, to compare the position of Epsilon Eridani with two nearby stars. From these observations, a parallax of 0.14 ± 0.02 arcseconds was calculated. By 1917, observers had refined their parallax estimate to 0.317 arcseconds. The modern value of 0.3109 arcseconds is equivalent to a distance of about 10.50 light-years (3.22 pc). My orientation skills are perfectly in order, thank you for asking. Especially for a “borderline imbecile” I do pretty well. I certainly do not claim those parallax values are “completely legit, foolproof and trustworthy”, that is the whole point. In the course of our lovely exchanges of emails I stressed the importance of your data sources, avoiding everything that comes from so-called “space” telescopes and use ground-based data consistently. You seem to have no problem including even pictures of Mars coming from the Hubble “Space” Telescope… Why would someone who researched space fakery for years do such a thing? The problem is that your last chapter doesn’t stand on itself. You name several stars in other, earlier, chapters in your book (shown in the glossary) and quite some of them now suddenly are in our vicinity, as a result of your last chapter. You have to deal with the implications of your own claims. On your own model. That is were the problems come from, don’t you see that yourself? And were your last chapter really a “proposal for scientific research”, then you did a poor job in presenting it as such. A proper scientific paper (or series of them in book format) indeed does present a section at the end with “recommendations for further research”. But that is not what you did. You present your book as “the only logically, scientifically consistent model” and only now at Cluesforum Hoi Polloi has asked the question “hey, let’s measure parallax”. In a scientific investigation you do that before you publish a theory, like your “parallax is caused by PVP orbit” claim. Parallax has been measured of quite some stars from the ground since the early 19th century, so there is no reason even to incorporate the “Gaia”, “Hipparcos” and other spacey stuff. I may be a “sub-par cognitive orientation-suffering two-faced clownesque bipolar imbecile”, so I ask the other readers here if they understand this latest graphic of yours. I cannot make cheese of it. “Start 1, End 1”, “Start 2, End 2”, etc.? What does it mean? Again no scales, no directions, no stars, it is a horrible graphic. You can keep going on the defensive (and silly offensive) against the readers of your book, but I assure you, you won’t get the exposure or a “peaceful” “Tychonic Revolution” that you aspire to. It doesn’t really matter if you are – as I suspect – a troll on the ESA payroll (or just a borderline imbecile). The problem I have with you is the following : if you don’t understand some parts of my research, why don’t you just e-mail me (as you have done countless times in the past) and ask for clarifications? See, you are not helping anyone in this world by airing your cognitive limitations ‘in public’, as you are presently doing here at Fakeologist.com…. After all, I responded to all of the 36 pages of intricate questions that you sent me – spending many hours doing so – via private e-mail. Yet, you never got back to me with any sort of comments to / or thoughtful assessments of my replies. Instead, you suddenly stopped communicating with me and started venting your frustrations here on this blog. This is, quite simply, not the behavior I would expect from a fair & balanced, intellectually honest individual. Let me ask you now: do you believe that the Copernican model is scientifically valid? Or does the TYCHOS model, in your mind, explain our inner solar system’s geometry in a better / more scientifically valid manner? Over to you. I expect a clear answer. Simon, in this chat and in your book you claim that the stars are “actually 42,633 times closer than reported”. 1 – Tycho Brahe, unable to measure parallax with his advanced pre-telescope equipment, claimed that the stars were “700 times farther than Saturn“, which would be 6657 AU (Astronomical Units). 2 – This claim for TYCHOS brings about huge problems, because suddenly you create a sphere with as diameter the distance to Pluto (78 AU), where we suddenly have many more bodies inside. The list shows the season the stars appear in the skies, the apparent magnitude, “official” distance, TYCHOS distance, a description and the position in your book (or not; many well-known stars are missing). – 4 stars closer to us than Saturn; Alpha Centauri A and B, Proxima Centauri and the wandering Barnard’s Star. A – How come none of all these celestial bodies in our vicinity, with some even close to our ecliptic, seem to have no effect on our solar system, either by gravity or electromagnetics or some other force? B – How come these stars look like stars (no clear structures like planets have) when they are so “extremely” close by? C – How incredibly small must these stars be, and the multiple systems even tinier and closer to each other, with the exoplanets then the size of some Fake X Tesla or so? A: How do you “know” that such bodies would / must have any effect on our solar system? Don’t you know that Isaac Newton himself admitted he had no rational explanation for ‘gravity’? B: What do you mean by “how come these stars look like stars”? Is there some “LAW” that regulates what stars should look like / and how big or small they should be? Why couldn’t these nearby objects be smaller than our planets? C: My answer to your question C would be: how incredibly LARGE must some stars be (which we can see with our naked eyes)? One of them is called “Mu Cephei”. Well, get this: according to Wikipedia, Mu Cephei is about 6000 light years away! Yet we can see it with unaided eyes from Earth! Wikipedia also tells us that “Mu Cephei could fit around 2 billion Suns into its volume.” en.wikipedia.org… Wow… Does this sound plausible to you, Gaia dear? Why don’t you submit questions to this world’s scientific / astronomy community and ask them how they can sustain such wild claims – before questioning my own, humble research? In the light of all this, dear Gaia, would you say that my TYCHOS model’s estimates (regarding star distances) are less credible than the “official” / Copernican ones? Let me know – thanks! I hope so, because in science (real science that is), nothing is “un-negotiable”. In chapter 4 you talk about the binary/multiple system of Sirius A and B (and C) and use that as an example for how our solar binary system can work with Mars. They revolve around a common barycenter. That is based on their specific masses. I am not talking about Newton, I am talking about your model with suddenly >236 more bodies in our vicinity. Which have no effect whatsoever (electromagnetics? visible light even?) on our solar system. They don’t even move, up to the ones close to our ecliptic (Beta and Gamma Virginis, 10 Tauri and the well-known and -studied bright stars Procyon and Epsilon Eridani). If in chapter 4 you use Sirius as an example of how our solar system could work, because “the Sun would else be an exception to the binary/multiple system majority ‘rule'”, but in chapter 36 the extremely small Sirius system is now located well inside the sphere of our solar system, at distances closer than Uranus, don’t you think that is a bit… inconsistent? You say you take the distances of the celestial bodies within our solar system as a given, because they are based on Earth’s diameter. That means also the sizes need to be (approximately) as the mainstream reports them. Which means the Sun is a huge sphere, clearly looking and feeling differently (heat) than all other bodies. But now we have many more tiny stars inside our sphere of the solar system, including many planets that you also used as points for claims in your book. So now the Sun stands out as huge with 130 stars inside our neighborhood as insignificant little bodies. C: My answer to your question C would be: how incredibly LARGE must some stars be (which we can see with our naked eyes)? One of them is called “Mu Cephei”. Well, get this: according to Wikipedia, Mu Cephei is about 6000 light years away! Yet we can see it with unaided eyes from Earth! Wikipedia also tells us that “Mu Cephei could fit around 2 billion Suns into its volume.” en.wikipedia.org…… Wow… Does this sound plausible to you, Gaia dear? Why don’t you submit questions to this world’s scientific / astronomy community and ask them how they can sustain such wild claims – before questioning my own, humble research? A variant of the tu quoque fallacy. I am not asking questions to a Copernican scholar, I ask them to the developer of the TYCHOS, “the only existing configuration of our “solar system” fully consistent with astronomical observation, physical reality and sheer logic.” as you claim. If you think your model, being “alternative” is not bound to proper scientific and logical scrutiny, we have a huge disagreement. I love consistency and think that is one of our best weapons against the mainstream in the “study” of “fakeology”. But why should applying that tool suddenly stop at the imaginary boundary of the mainstream? You show your model is not consistent, certainly not “fully”, introduce even more inconsistency and even your reasoning is not consistent. If you don’t like it that the Sun is the odd one out in terms of being non-binary, that’s fine, but you don’t have any problem with the Sun being so gigantic while more than 130 stars now inside our solar sphere are nothing more than tiny specks of light, many of them smaller than planets, based on their apparent magnitude? Why does the Sun move through space with a whopping 107,000 km/h, while all other stars who now ended up as closer neighbors than Pluto are completely immobile, except the very faint Barnard’s Star, that wanders like a snail compared to Sol through our skies? I am not talking about the mainstream, I am talking about your model. If you claim it is “the only fully consistent model with observations” then it needs to live up to that high (and unscientific, in more than the 1000 scientific publications I have read, 0 scientists have claimed such a thing) standards you set for your model. And also; your “estimates” are nothing more than the mainstream estimates divided by a fixed number. So you haven’t estimated anything independently; you rely on the mainstream data. No answer also why all those exoplanets are tiny, extremely close to those tiny host stars, the exo-asteroid belts, etc. Jupiter, Saturn, even Earth and Pluto can be exceptionally huge planets without problems, but now more than 100 exoplanets are minuscule balls orbiting tiny stars at insignificant distances? Fully consistent with logic, you said? – The long and short ESIs of Mars (which I never knew about) prove the Copernican model wrong. Dead wrong. Great convincing evidence. – The link with the Maya calendar is extremely interesting, great paper. It led me to reanalyze another pre-Columbian civilization (the 4th in a series of 4 that nobody knows about; everyone knows Aztec, Maya and Inca, nobody knows the Muisca, my area of research for 1.5 years). Their extremely complex calendar has been analyzed for the sidereal and synodic lunar months and the solar year. But…. now I’ve looked at it again and it even incorporates (and explains the complexity) this full ESI cycle of Mars (7 long ESIs + 1 short ESI)!!!! – I think you make a strong enough case. Again, in table form would be the best with references at the end, like the Space fakery page at Fakeopedia. -(…) You have just debunked the mainstream model! So you DO recognize that the TYCHOS has ‘debunked’ the Copernican model, do you not? Yet, here on this public place all you do is complaining about stellar matters (which make up only a small fraction of my book) and pepper your comments with thinly veiled attacks clearly meant to dismiss and ridicule my work? You are, quite frankly, exhibiting the classic antics of a petulant, two-faced knavish clown, my dear Gaia. Please calm down. As you well know, the TYCHOS model’s primary points have to do with the geometry & celestial mechanics of our inner solar system. This is what I refer to when I say that the TYCHOS is the only model which agrees with observation – since it is a demonstrable fact that the Copernican model does not. Since there currently is no other existing model which agrees with the observed motions of our own system’s bodies, the TYCHOS is effectively the only one that does. To be sure, only the two last chapters of my book deal with star-related topics – and I certainly do not claim that the TYCHOS resolves in one fell swoop the distances, speeds and distances of each one of the trillion stars and asteroids populating our skies: as you surely know, we are currently (calmly) discussing at Cluesforum about how we may, ideally, perform some day a verification of the stellar parallax data currently published by ESA. As it is, some eminent & highly-qualified astronomers have already strongly questioned this data. We are not alone. …well, it is just incredibly silly. If you don’t retract it, I think I’m done with you, loco. So you, of all people, dare talk about “inconsistency”? Well, what about your own behavior these last few months, loco? Simon, TYCHOS is about Gaia, but not about me. I am sure you understand what I mean. You have written several private mails to me and submitted 36 pages of questions about the TYCHOS (in three 12-page installments). I have done my best to respond to your many questions – yet you haven’t gotten back to me about my answers. Hence I started that TYCHOS glossary with terms, bodies and researchers. I even linked to your online version of TYCHOS so the ones with access can immediately go to the specific chapters. It is a strange comment anyway, I am quite sure that if astronomy professor (42,633 times above my level) Vittorio from let’s say Bologna would ask these things, you won’t respond like that. Or if you do, I reckon you lost a reviewer. Confusion comes from two parties; the speaker and the listener. Yes, the beginning was confusing, but later when reading on things got cleared up. Again, I hope you won’t react like that to good old Vittorio…. Which is fair enough, and so I did. And do you know how publishers work? You cannot just go to them and say, “I know you printed my book now, but please, I have a new version, so do that instead.” In rare cases scientific journals and books have addenda or errata published afterwards, but the norm is a product that stands on itself, not needing a “version 2.0”. Yes, I support the parts where you debunk points of the Copernican model that are vague, impossible or “explained” by new patchwork of silly theories. Those parts are good, from my limited position. Vittorio sees much more. And I hope you get 100s of Vittorios to look at your work. But, the TYCHOS book comes in one piece. Especially the hard-copy version. In science it doesn’t work like keeping the first 34 chapters, but tearing the pages of the last 2 out because they introduce more problems than the Copernican model. I recognize you have debunked certain important points from the Copernican model that I never knew were so shaky. So in those parts you have done a good job. But that cherrypicking is not how science works. And living up to “the only fully consistent model with observations, physics and logic” means your own work has to be fully consistent too. Consistent in content, because that is what it is about, not personalities. Our imaginary Vittorio is not a psychologist, but an astronomer. Those stellar matters are part of your book. They are part of TYCHOS. They make the whole model suddenly become incomplete, because there are many more bodies even at and close to the ecliptic inside our binary solar system. And that you see founded criticism as “attacks” is one of the problems. A proper scientist (or a musician publishing a scientific book and model) does not need to become defensive (and offensive). You have become so completely entrenched in your work and model that you lost your normally so sharp eye for fakeology and proper reasoning. And how do people work? If you take your TYCHOS book as a 36-course meal (not uncommon in Italy…) then what do you think your guests will take away after it? The good to delicious first 34 courses, or the bitter, ugly aftertaste of the dessert? As you well know, the TYCHOS model’s primary points have to do with the geometry & celestial mechanics of our inner solar system. This is what I refer to when I say that the TYCHOS is the only model which agrees with observation – since it is a demonstrable fact that the Copernican model does not. Yes, and those points are good, from what my trained amateur eye can tell. I hope Vittorio can help you further. Since there currently is no other existing model which agrees with the observed motions of our own system’s bodies, the TYCHOS is effectively the only one that does. To be sure, only the two last chapters of my book deal with star-related topics – and I certainly do not claim that the TYCHOS resolves in one fell swoop the distances, speeds and distances of each one of the trillion stars and asteroids populating our skies: as you surely know, we are currently (calmly) discussing at Cluesforum about how we may, ideally, perform some day a verification of the stellar parallax data currently published by ESA. As it is, some eminent & highly-qualified astronomers have already strongly questioned this data. We are not alone. That is the whole point. If you cannot verify these things independently, why even talk about them? Why shrink the stars (and their exoplanets) to minuscule bodies now suddenly appearing as our neighbors, closer even than Saturn, well-known in pre-telescopic times? So you base your idea that those stars are so incredibly close to us on both the mainstream model you criticize and data that wouldn’t be there without that model. Do you see that that is not proper reasoning? What are your ideas about TYCHOS so far? Well, thanks for the hearty laugh, Gaia… See, if there is ONE thing that I’ve learned in this half-decade of uninterrupted “cosmo-logical” studies, it is that the science of astronomy is an endless trail of continuous revisions / corrections / wild speculations / conjectures / approximations / assumptions / retractions / ad hoc, confirmation-bias-motivated “solutions” and “explanations” / mathematical wizardry and so on and so forth. I would go as far as saying that not a SINGLE astronomical book / paper ever written has stood (100%) the test of time. Today, mainstream astronomy has dug itself into a black hole of invisible dark matter (due to the embarrassing fact that Newton’s untouchable “laws” are flatly contradicted in the stellar sphere, i.e. totally inconsistent with what Newton postulated to be true for our solar system ) – and only a truly scientific ‘big bang’ could make this sorry situation come to an end. I have no agenda other than defending the scientific method, which I see as one of the best tools to counter the amount of propaganda, lies, stories and indoctrinations we have received throughout our lives. Goretti analyzed a decent amount of stars and found very different parallaxes and thus distances (1/px in pc). I linked an earlier paper by him in the glossary, you may have seen it. The closest star he determined at 1.05 ± 0.10 ly away (GSC 3573 129), which has no parallax data given by the Tycho Catalogue. The closest that star would be is 0.95 ly, versus 4.24 for Proxima Centauri. The closest star where he could compare his own measurements and that of the mainstream is GSC 3276 733 where his parallax (1426 ± 150 vs 32 ± 17 of the mainstream) gives a distance of 2.3 ± 0.3 ly, or a reduction by about a factor 45. Still way outside of the Kuiper Belt, the area Pluto is in. 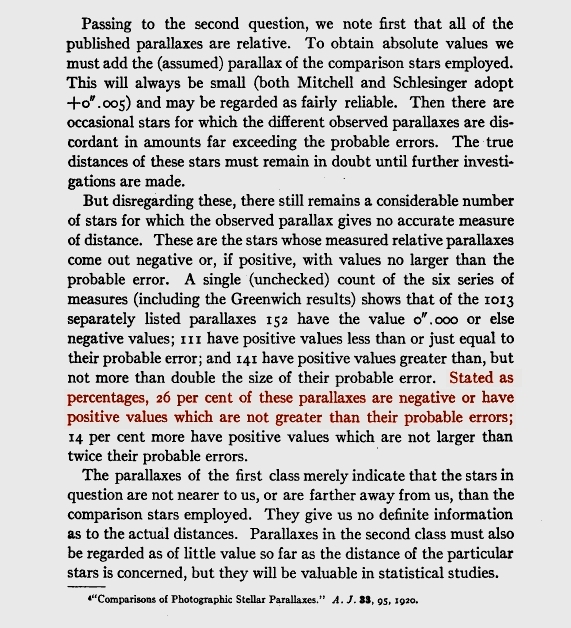 His analysis also shows that Barnard’s Star, measured not by “space” telescopes, but first by Barnard himself in 1916 and later by Van de Kamp in 1969, has a very comparable parallax to the mainstream value. Your model however claims that the distance to Proxima Centauri, not based on astronomical observations like Goretti’s, is a mere 6.48 AU, or 0.0009.945 ly away… Making it (including an exoplanet) sit comfortably and virtually immobile and unaffecting between Jupiter and Saturn. Don’t you think there is quite some difference between a factor 45 and a factor 42,633? If you think reasonable doubts about parts (and taking into account you use those stars in your book as a basis for the possible very binary Sun-Mars system, like Sirius, so it is not just the last 2 chapters) of your book, model and reasoning are “a bit stupid” or “denigrating your work”, I fear science is not your cup of tea. If you think that building the 2nd biggest page on the whole Fakeopedia is “denigrating your work” and “a bit stupid”, I fear you misunderstand me even more. 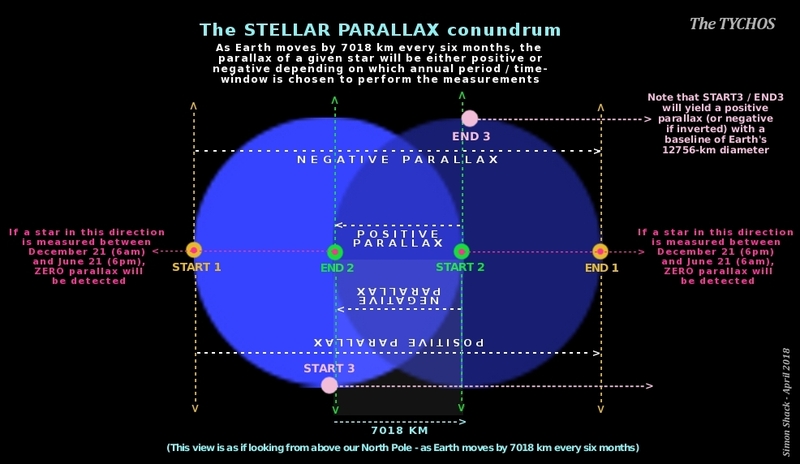 The claim you make that “25% of all stars need to show negative parallax” according to the PVP orbit, would mean you have measurements of huge amounts of negative parallaxes in the December skies. Hence why I included the skies in the list and made it sortable. Goretti lists small amounts of negative parallax for some stars, but on the other hand measures far more -positive- parallax for other stars. It would be cherrypicking to only take the slight negative values and not include the >1 arc second ones he published. Simply stating “25-50-25%” is not a scientific approach and does not take into account causation. This point was also brought up by Seneca at Cluesforum, so more people question this point. Best of luck, a “little bit stupid” scientist. So you actually ARE pretty damn stupid, Gaia (or just pretend to be) – I get it now. This is not a “claim that I make”: it is a VERIFIABLE FACT that 25% of the stellar parallaxes officially published by ESA on their catalogues have negative values. Good heavens, Gaia: what exactly are you up to? You remind me of that “Ace Baker” clown who (many years ago) immediately “hugged up” to my September Clues research. He then spent lots of efforts promoting it – and even went on presenting September Clues at “9/11 truth” conferences around the USA – only to state a while later that “September Clues is 98% false”. So please give us a break, Gaia: I’ve seen it all before – thank you very much. 2 – how much negative parallax do those stars have. If it is just the very low figures Goretti lists, it is not conclusive to claim your explanation for those negative parallaxes. The proper scientific method is first formulating a hypothesis, then testing that, then documenting it and then publishing. Your approach seems to be first claiming something (like a “theory”), and then trying to fit reality to that. Very mainstreamy, you could work for ESA, easily, fratello! Thank you, I have been searching for that VERIFIABLE FACT, to little avail, well, I found Goretti’s 2009 paper with it. SIMBAD doesn’t list any stars with negative parallax and the Gaia (not me; the “space” telescope) catalogue is not accessible. All the other things are irrelevant for my arguments, but I understand you’re grasping at straws now when you fail to realize how f*cked you are when you placed the bomb under your own model. I was positive about you and your work, but it is only you and your unscientific hostile attitude that has destroyed it. “I am right, swallow my ‘theory’, if not I start namecalling and digressing into nonsense, after all I am right anyway”. Prof. Dr. Simon Albert Einstein von Hytten bis Shack needs to do quite some work before anyone with a decent scientific background will take you seriously. Try calling Vittorio a “two-faced clown” and see how far you come. What a fantastic statement, Gaia – I’ve gotta love it. Good lord – what a waste of taxpayers’ monies you are. Do you read the same thing Simon, or do you actually read what you want to read? If I ever have a cherry orchard, I will pick you as my court jester. Team TYCHOS’s programmer extraordinaire Patrix has done a screen cast of his TYCHOS Planetarium so you can view the basics of TYCHOS. The image below is a screenshot from the video of the path of one of the sun’s moon, Venus, as it rotates around the sun while simultaneously rotating around earth, of which the earth is also rotating along its circular path at a gentle 1 mile per hour. Remember, TYCHOS fits observable views of our planets and both past and present planetarium charts. Well done Patrix for bringing TYCHOS to life! Not only is TYCHOS a model of our actual solar system, where you live, but it is also your new calendar; the thing that kings and emperors paid for in untold sums in riches in order to maintain the ability of timeliness for planting schedules in order to feed the masses of people they rule, as well as have the ability to foretell celestial events such as eclipses and the coming of comets. With TYCHOS there is the very real possibility that ice ages can now be predicted with accuracy. What else does TYCHOS do? Being a binary system and showing that stars may exist within our solar system, it has the potential to replace the idea of ‘dark matter’. The TYCHOS is also showing that the physics of our universe appears to support an aether, which means Einstein and Hawking and the like are just plain wrong. So you see, the TYCHOS is much more than just a solar system model. It is uncovering the actual physics that make up life in this universe. And we’ve only just begun the journey of uncovering and discovering what the TYCHOS will bring forth. The TYCHOS is one big massive manifestation of our new physics. All from the mind of one man. How incredibly is that? Thank you Simon Shack. The journey has just begun. Let me get back to you on that live chat, Faye. Been a little busy lately. Thanks so much for the lovely invite. Anytime, dear Kham, will be my pleasure.